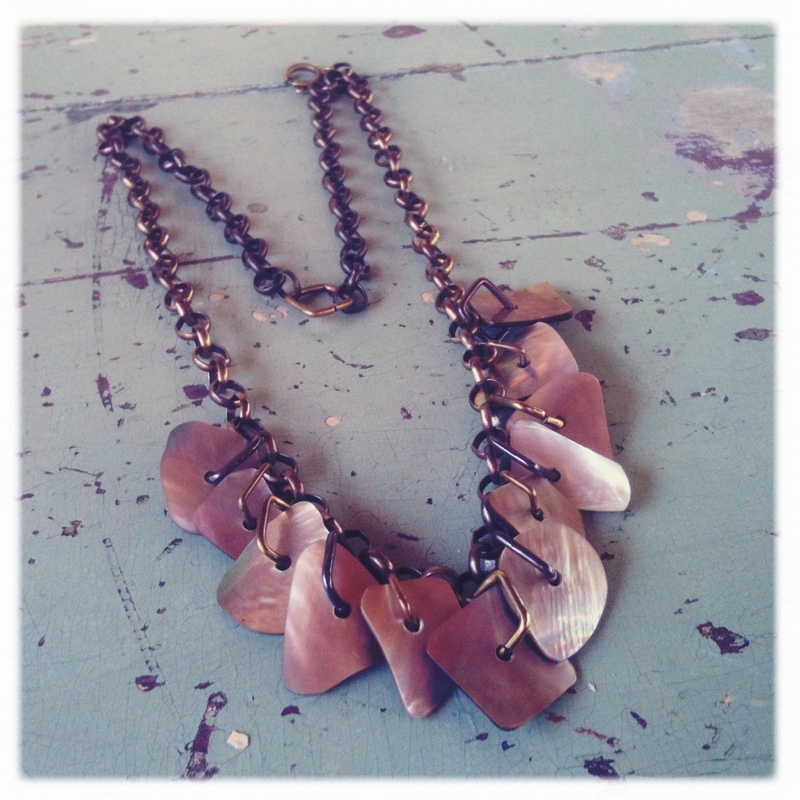 This necklace consists of large, flat abalone discs suspended from a large-link chain with square jump rings. It’s simple and dramatic. Hmm, wait…I am kinda seeing a trend in my work. Wow, didn’t know that would happen. Really. When I started this blog (exactly one month ago) I thought I’d unearth some long-forgotten jewelry designs. I figured I’d find something mildly interesting to write about a few of them and otherwise the blog could serve as a digital portfolio of my work. I also hoped it would make me break out of the rut of wearing the same necklace for a week and then choosing another one…to wear for a week. AND, truth be told, I would have bet you that most of my jewelry was complex and busy. But somehow, the nice little graphic representation of my tags right there on the right tells another story. Look at how big the word ‘simple’ is. Now, sometimes I worry that I choose simple because it is a shortcut to the end result. Meaning that while I could have, say, put these same discs in a fringed, peyote-stitched collar I didn’t. ‘Cause that would take for-ever and I’m lazy? Because it might be a bit fussy? Hmm, gotta ponder that.